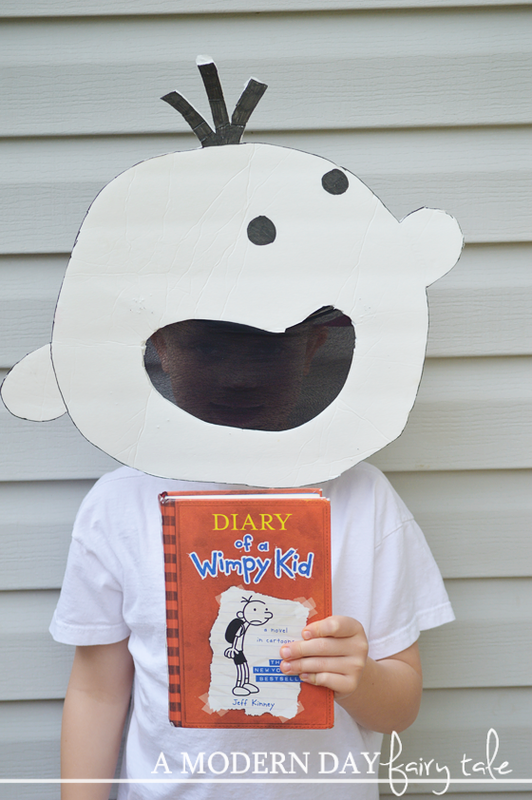 When my son first told me he wanted to be Greg Heffley from Diary of a Wimpy Kid, I must admit, I was a little terrified! We've done DIY costumes in the past, but they tend to be pretty simple... and since my son wanted the full cartoon head? Well, this one didn't sound so simple! Boy, was I wrong! Turns out, it could not be easier! 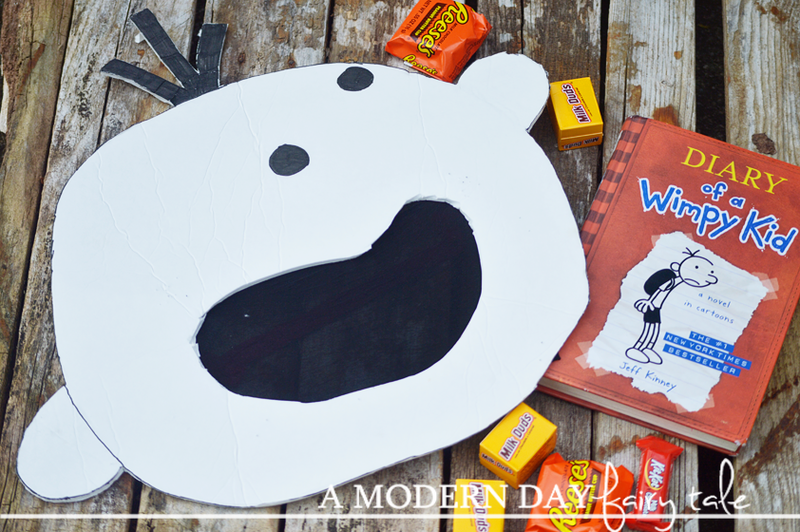 If you have a little one who loves Wimpy Kid, you can follow these easy steps to create a fun mask that they are sure to love! First up, find a picture for inspiration. Look at one of your child's books, or search online. You will want to find one with an open mouth for your child to see through. Now, use a pencil to draw Greg's head and face onto the foam board. (This looks very much like a typical poster board and is found near it but is a thicker foam board- I found ours at the Dollar Tree). I am by no means an artist, but thankfully, he is a super easy character to draw! The picture I found had a great angle that made the ears and nose super easy to pull off! Next up, carefully use a knife to cute out the head. Be mindful of the nose, ears and hair. You will also cut out the mouth. Now, use a Sharpie to go over the facial details. Also, run it around the edge of your mask to given it a more cartoon look. Staple onto the back of the mouth, on all sides. (Note: We did find that the staple came through ever so slightly in the front, but not enough to be noticeable. You could instead try hot glue, if preferred but we felt the staple did a better job!) As you can see, it doesn't have to look pretty on the backside! Finally, finish up by adding a piece of elastic to the back to hold it on. The kind you use for baby headband was perfect for this project. A look at the back of the mask... a little messy but it does the job! Pair with a white tee, black pants, and black backpack and you are set! 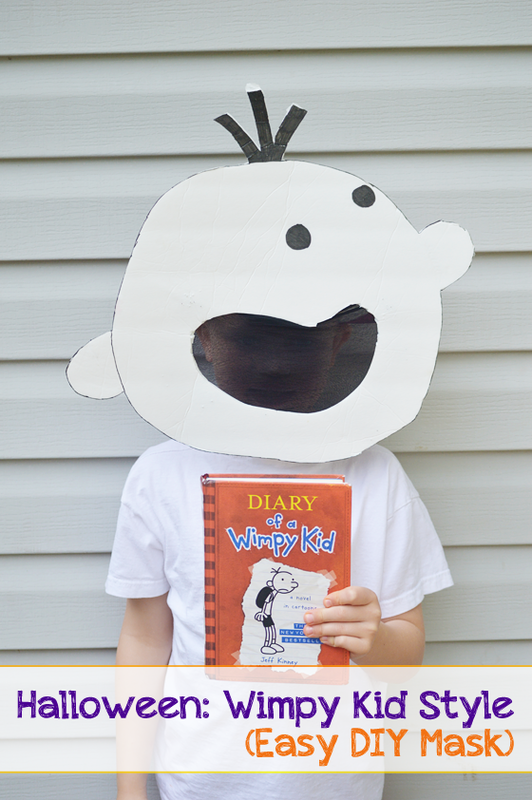 Create a large Diary from a cereal box, or have your little one carry a copy of his favorite Wimpy Kid book. There you have it! Not only is this project super easy, it's also incredibly inexpensive as well! Looking for more book character costume inspiration? Be sure to check out this fun post! I saw this on Facebook, it is so cute, and a great idea! My son has read all the books, he likes this costume idea a lot, thanks!